Set in 11 acres, the hotel nestles in mature tropical gardens, and offers great facilities with a high level of service. There are two sides to the accommodation, so you can either choose to soak up the atmosphere in the Historic Wing, or enjoy contemporary style and comfort in the Mailani Tower. 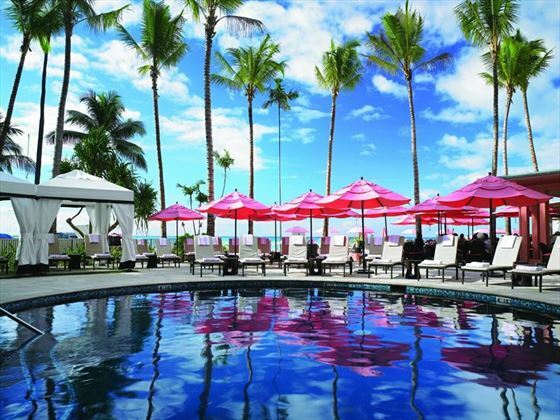 A wonderful choice for a honeymoon, anniversary or just because you deserve it, this hotel is a great place to experience Hawaiian hospitality at its best. This iconic pink building, known as "The Pink Palace of the Pacific" is a Waikiki landmark, and is situated in a central location right on Waikiki Beach, Oahu Island. Poppins Daycare offers a variety of activities including pool and beach fun, cultural activities and family attractions.